HEYDAY. It must be the history, the remaining turn-of-the-twentieth century architecture, or the dusty bits and pieces of memories romanticized by great grandparents that led a group of artists into reviving the vibrancy of Escolta, not as the country’s premier high street as it was in the 1900s but this time as an accessible and popular cultural and artsy center in good old downtown Manila. The recent staging of the Escolta Saturday Market where vintage items were sold in what used to be the site of the fashionable Berg’s Department Store in the 1930s is an attempt to bring back old world Escolta in its heyday and perhaps the first step in making generations familiar of that forgotten place and time. NOSTALGIA ESCOLTA. But to say that we have forgotten about Escolta is an understatement. For one thing, our generation is not fortunate enough to live in that era when Escolta became the country’s classiest shopping destination. That’s why it is not surprising to learn from some people that they do not feel any connection or relevance when passing by this short thoroughfare in Manila today. However, nostalgia can strike us when looking at old photos of Escolta. Its rows of opulent shops, which were actually traditional bahay-na-bato with sliding panels of capiz windows on the second floor and huge glass display windows at street level where all conceivable caprichos and overpriced imported luxuries were sold. PHILIPPINE’S FIRSTS. The famous emporium La Estrella del Norte and La Puerta del Sol which marked the east and west entrances of the narrow thoroughfare, introduced the first bicycles, cameras, phonographs and the trendiest and most fashionable home furnishings to the biggest spenders of that time. A good find in the Saturday market were the mugs with images of vintage cars and bicycles printed on them. This fittingly recalls when La Estrella del Norte brought in the first automobile in the country called a Richard, which was bought by a certain Dr. Miciano –an affluent physician. PRIMERA CLASSE. La Puerta del Sol is said to have sold the finest European décor and household ware. In 1875, it introduced the term tulipan referring to gas lamps with tulip-shaped glass chimneys. In the 1920s and 1930s, Escolta shops selling all kinds of gas lamps made of glass were generically called tulipan. Just like in the Saturday market, everything for sale has been generically called pre-loved vintage items. Other high end stores like H.E. Heacocks and Oceanic were known for the exquisite household items. While Fashionable clothes were displayed at Berg’s, quality leather and shoes were stocked at Hamilton Brown or Walkover Shoes. ESCOLTA HERITAGE. It was also in the twenties and the thirties when art nouveau and art deco design elements were incorporated in the architecture of Escolta’s landmark buildings like the Crystal Arcade, Capitol and Lyric Theaters, Calvo, Natividad, Burke, Regina, and Perez-Samanillo (First United Building). Some of these buildings are now gone and only be seen in old photos and in miniature models at the Calvo Museum. DREAMING ESCOLTA. Pre-war Escolta only reigns in the memory of those who were fascinated by its grandeur. With the old glamor gone, the Escolta we know today is just a narrow street in Manila with decrepit art deco and art nouveau structures just waiting to be revitalized for adaptive reuse as cafés, restaurants, wineries, art galleries, art schools, culinary schools, creative workshop venues, exhibition spaces for art fairs and trade shows, boutiques, vintage and antique shops, bookstores, music stores, graphic design studios, photography studios, band rehearsal studios, etc. etc. EPILOGUE. The successful staging of the Escolta Saturday Market is an inspiration to those who have all of the above in mind. Our generation can now start looking forward to a time and period when an accessible and popular, still old world yet artsy Escolta is thriving and pulsating once again in good old downtown Manila just like during its ‘forgotten’ heyday. 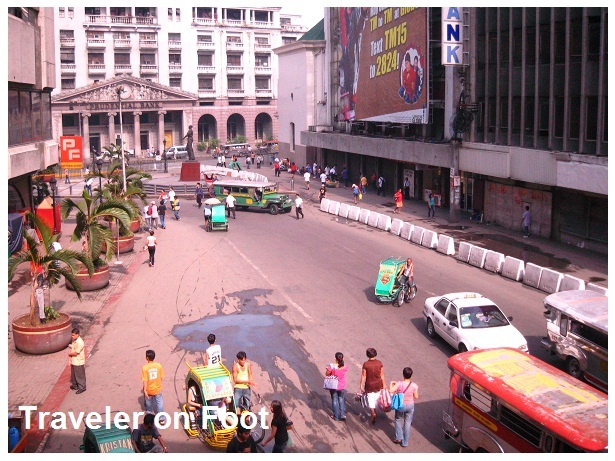 MANILA’S HISTORIC HIGH STREET. Money and power once passed the old Calle Escolta. The Governor-General with his escolta or escorts passed by this road from Malacanang on his way to his office in Intramuros. 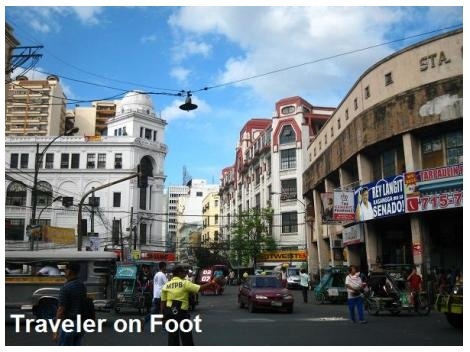 At the time when Jose Rizal’s Crisostomo Ibarra strolled old Binondo, cobblestones imported from Hongkong paved the historic thoroughfare. The old rows of Chinese stores called camarines were replaced by glorified bahay-na-bato adorned with Neo-Classical elements like Greek columns and caryatids. In the 1900’s, Escolta became the country’s premier shopping destination. It was home to high-end stores La Estrella del Norte and Puerta del Sol which marked the east and west entrances of the narrow thoroughfare. Manila’s elite purchased fine household items at H.E. Heacocks and Oceanic. Fashionable clothing were displayed at Berg’s. The gentry buy quality leather and shoes at Hamilton Brown and Walkover Shoes. Botica Boie mixed potent medicines and served the best soda and clubhouse sandwich in town. ESCOLTA SENTINELS. As we emerged from the gate at right side of Sta. Cruz Church, two impressive buildings attracted us to cross the bridge spanning Estero de la Reina. The majestic buildings, one with fancy Art Deco elements and another in an elegant Beaux-Arts architecture stood face-to-face each other as if competing in grandness at the entrance of Calle Escolta. ART DECO PEREZ-SAMANILLO BUILDING. By the second half of the 2oth century, the jazzed-up architectural style known as Art Deco manifested in the Philippines. In Escolta, the Perez-Samanillo Building is one of the few surviving specimens of the Art Deco age in the city. Built in 1928 by Andres Luna de San Pedro, the pink Art Deco building was once described as Manila’s foremost business address. It prides itself in enticing would be tenants of maximized space, abundant lighting and ventilation and a large amount of architectural and decorative elements. While looking at the building’s awesome façade, our eyes were drawn at its central bay that rises towards a crowning block rendered with a bass relief of the Creation. BEAUX-ARTS REGINA BUILDING. 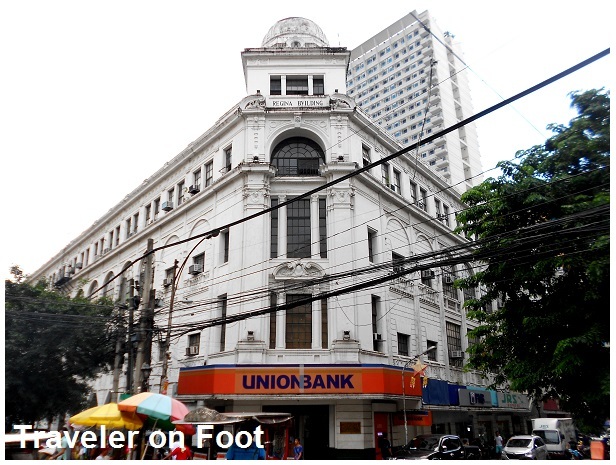 Facing the Art Deco Perez-Samanillo Building, in graceful white Beaux-Arts architecture is the Regina Building . Built in 1934 also attributed to Juan Luna’s son – Andres Luna de San Pedro, it was originally designed as a three-floor commercial building. When the de Leon family bought the building from the Roxases, a fourth floor was added by architect Fernando Ocampo -founder of the UST College of Architecture. The senate staff of the late Senator Vicente Madrigal rented a suite in Regina Building while on the same floor across the hall was the office Madrigal Shipping, then the world’s largest tramp steamship company. LANDMARK STRUCTURES. The Burke Building was the location of the first elevator in the Philippines. The building was named after the cardiologist William J. Burke who introduced and installed the first electrocardiograph in the country. Other landmark structures in Escolta are the charming pre-war Natividad Building that evokes a café in a Parisian neighborhood and the 1933 Calvo Building with its stunning beaux-arts architecture. American war correspondent Robert Stewart sent the first signal of the radio station DZBB from a makeshift studio on the fourth floor of the Calvo Building. This historic event was the first broadcast of the Kapuso Network GMA channel 7. ESCOLTA THEATERS. There were two theater cinemas along Escolta –Lyric and Capitol. Both high class movie houses brought the glitz and glitter of Hollywood to Manila. Lyric Theater was an Art Deco masterpiece of Pablo Antonio while Capitol Theater was designed by Juan Nakpil. The former was been demolished while the latter is awaiting to be restored. Capitol Theater stood majestically amidst its decaying and dilapidated shell. Built in the 1935, this Art Deco jewel once had mounted on its balcony a wall mural by Filipino modernist Vitorio Edades. On the face of its western tower were bas-reliefs attributed to Francesco Ricardo Monti. These relieves show allegorical characters in traje de mestiza, one holding a mask and another holding a lyre frame by evocative Art Deco lines and curves. EPILOGUE. From Sta. Cruz Church, our Escolta walk ends at Plaza Moraga. Named after the first parish priest of Paco, Fray Fernando de Moraga, the plaza was the site of the first ice cream parlor in the country. Clarke’s Café became a sensation when it opened in 1899. From the foot of Jones Bridge we walked towards the stately Chaco Building and slipped under the Filipino-Chinese Friendship Arch to begin the Binondo Heritage Walk. But that’s another story. Enclosed in glass shelves are vintage bottles, old photographs and old newspaper articles that perhaps showcase Escolta and its vicinity to be the Philippines’ Western Emporium at the turn-of-the-century. Also on display are scale models of existing and non-existing buildings located along this short thoroughfare along the Pasig River. The product and services offered in Escolta are highlighted in an exhibit of newspaper advertisements. The advertisements are mostly from Spanish to the late American Period. These ads feature imported household products to overwhelmingly agrarian Philippines then. The ads revealed that Filipinos of that era has imported everything from phonographs to sliver spoons, from shoes to empty bottles! Most of the bottles surfacing in Manila were used from the late 19th century until the pre-World War II era. From 1917 to 1933, empty bottles and jars made up of one third of imported glassware reaching the Philippines including tableware, mirrors, window and plate glass, eyeglasses and lamp chimneys. According to Felice Prudente-Sta. Maria, these bottle collectibles were partly the result of conscientious bottle recycling prompted by the lack of local bottle makers. Housewives had to present containers when purchasing cooking oil, kerosene, vinegar, fish sauce, carabao milk, locally distilled liquor and a host of other liquids. Dark green bottles usually held gin or the one popular anise wine. One version is stamped La Tondeña. Like their European counterparts, Manila druggists displayed apothecaries with colored water in their windows and sold patent medicines. They came in cheaply made amber, aquamarine, green or clear bottles stamped with brands and cities of origin. Cobalt blue bottles that held poisons or acids, essences, and light-sensitive compounds meant strictly for external use, eventually became containers for laxatives, salts, and even an archaic fragrance called Blue Waltz bottled along the Pasig River. In the 1800s, charged and soda waters were the rage due to the rising health consciousness as a result of earthquake tolls, cholera and other epidemics. Sta. Maria noted that the bottle-capped beverage was introduced in the early 1900s by a Japanese drink called Tansan. The company left bomb-shaped bottles embossed with its brand name that remains the local word for bottle cap. However, not all bottles are glass. Beer came in thick, cream colored ceramic containers that sometimes sport broad golden brown bands across the rim and shoulders. They were used well into the late 1800s by Scottish and English breweries. Previous beverages like rum, ginger-beer and whisky were also stored in clay bottles, a practice that continued to the 20th century. Philippine glassmaking only began in 1937 when San Miguel Brewery set up the first bottling plant in Philippines. Its initial product was a tall. Slim, moss green beer bottle. Previously the firm’s containers came from Hongkong, then Japan. I appreciate the effort of those who put up this museum. Not only that the exhibit provides visual details about the architectural structures that once stood along Escolta, it also gives its visitors a glimpse of the preferences, lifestyle and taste of the Filipino during that era. In 1950, the Ting brothers put up a panciteria in Quiapo. The panciteria served only lomi until the brothers decided to expand the variety of their menu to meet the rising popularity of their restaurant. A special recipe for chicken and gravy was created which became popular among customers who would come to dine in their small restaurant. The special chicken recipe was famous for its tenderness and flavorful juicy taste. 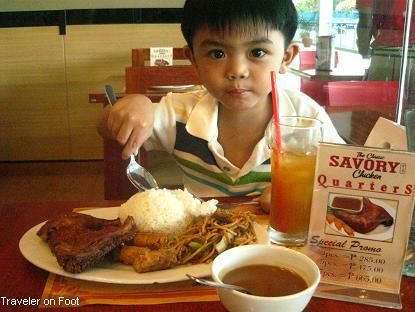 Soon, the Savory Chicken House opened its first branch in Escolta.